A petition from a Bute resident seeking official recognition for the historic Scottish Ensign will be heard in Inveraray next month. George McKenzie’s petition will be one of three considered by the Scottish Parliament’s public petitions committee when its meets in the town’s Argyll Hotel on Monday, September 7. Mr McKenzie, who spent 14 years in the Royal Naval Reserve, during which he reached the rank of lieutenant commander, wants the Scottish Government to take the steps required to allow the flag - which is the same as the famous Red Ensign, but with the Union flag in the corner replaced by the saltire - to be flown more widely. At present its display by Merchant Navy ships is technically illegal, although there are no records of any prosecutions under the relevant legislation. The committee will also hear evidence from transport minister Derek Mackay as it pursues a petition calling for a permanent solution to the long-running problem of landslides closing the A83 at the Rest and Be Thankful, and will visit the site of the Tinkers’ Heart monument, recently made a site of national importance as a result of a petition put before the committee. The meeting, which will also include a question-and-answer session, runds from 2pm until 4pm on September 7. The committee’s convener, John Pentland MSP, said: “The committee is keen to welcome as many local people as possible to be part of the audience at our formal meeting at the Argyll Hotel. 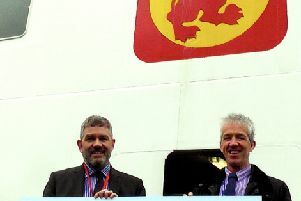 “As well as the opportunity to hear the Transport Minister discuss the future of the Rest and be Thankful, we will also hear for the first time from petitioner and Isle of Bute resident George MacKenzie on his bid to boost the number of boats flying a Scottish Ensign flag with a St Andrew’s Cross in place of the Union Jack on the traditional ‘Red Duster’.